KERRY GROUP RÁS MUMHAN’s 4 DAY INTERNATIONAL CYCLE RACE was officially launched today on the Conor Pass outside Dingle, by Mr. Frank Hayes, Director of Corporate Affairs, of sponsor Kerry Group. Stage two of the race will finish on top of the Climb to the Conor Pass on Saturday 23 April. This prestigious event will boast a field of close to 150 riders from Holland, England, the Isle of Man, Wales, France and Germany who will compete with the best of the Irish over four days of racing on the Easter Bank Holiday weekend, Friday 22 April to Monday 25 April, 2011. Last year’s winner Corkman Timmy Barry will lead the Irish challenge, while the local attempt to keep the title in the Kingdom will be led by Sean Lacey and Paul Griffin. Speaking at the launch, Mr. Frank Hayes, Director of Corporate Affairs, Kerry Group commented: “With only two weeks to go to the Kerry Group Rás Mumhan and with today’s announcement of such a strong group of local, national and international participants, anticipation is growing among the cycling world that this year’s event will be a very competitive affair. He added: “The Rás offers a unique opportunity for spectators to enjoy the scenic views of the south west of Ireland while watching top class cyclists compete over County Kerry’s challenging landscape for the much sought after Kerry Group Rás Mumhan winner’s title”. As in previous years the race will be held in four stages over four days: stage 1 will take place on Good Friday 22 April in the East Kerry area. Stage 2 will take place on Saturday 23 April in West Kerry, with a visit to South Kerry on Easter Sunday 24 April for stage 3 of the race. 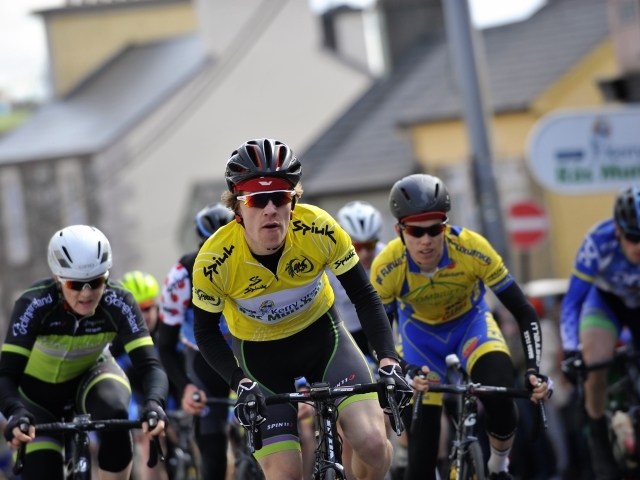 The final day sees the race go back to Killorglin for a stage in Mid Kerry. Full details of the stages and times can be seen on the race website at www.rasmumhan.com . Speaking at the launch, Mary Concannon, race organiser said: “The value of the Kerry Group association with the race is enormous and cannot be underestimated. Kerry Group supports many of the top sporting events in County Kerry and beyond, and we are extremely grateful that they are continuing their sponsorship of this event which has enabled us to take the race to a new level and continue to promote cycle racing in Ireland”. Kerry Group Rás Mumhan is organised by a voluntary committee and the community’s involvement in the race is important to the event. The organisers are aware that the roads of Kerry are busy over the Easter Bank Holiday weekend. Therefore the assistance of an Garda Síochana and the co-operation from road users in Kerry as the race passes by is of vital importance to the success of this event. The spin off to the local economy is over 1,200 bed nights needed by the competitors, their back up staff and officials.